2958 N. Cloverdale Rd., $309,900: It’s rare to see a SYCAMORE model available in the much sought-after gated community of The Orchards at Cloverdale, a peaceful pocket neighborhood with English cottage exterior architecture and stunning landscaping. The split bedroom floor plan features a bright and airy sunroom and French doors, with plantation shutters in the main living areas. The kitchen is showcased with stained Alder cabinets, full tiled backsplash and granite countertops. You’ll love the Master suite, oversized with a double vanity, fully tiled walk-in shower with bench, and two walk-in closets. The secondary bedrooms and main bath offer privacy along a separate hall. Great laundry room and built-in bench with cubbies near garage access. Beautiful patio overlooks common area and clubhouse. Pleasing details include vaulted ceilings, water softener, insulated garage door, cellular darkening blinds in bedrooms, drop-down ladder for attic access and two storm doors to help bring the outdoors in! The Orchards at Cloverdale is a neighborhood known for its maintenance free lifestyle. HOA monthly dues include water, sewer, trash, landscaping, snow removal and exterior building maintenance (excluding windows). Enjoy seeing friends and neighbors at the clubhouse, which has a fitness center, catering kitchen, large gathering room and a heated outdoor pool. To view more photos>> 2958 N. Cloverdale Rd. 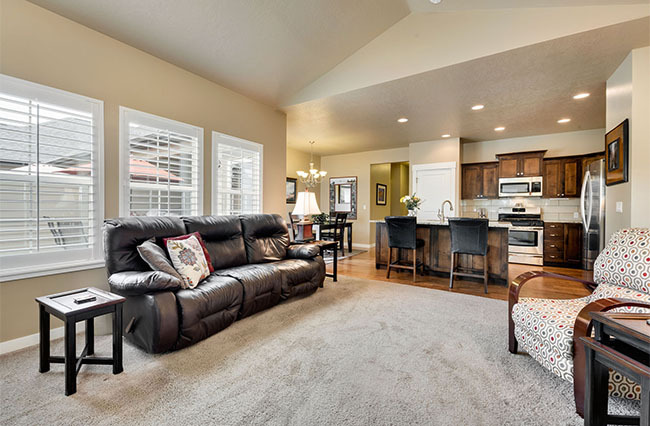 Please call Angie at 208.250.2774 for your private showing today!